How would you feel about an annual subscription? If you’re a fan of EA Sports titles, you’re probably well-accustomed to the annual ritual that takes place every August and September. It’s the time when all of the new and tweaked sports games are released and your bank account takes a UFC-style beating. It could, however, be a ritual that’s coming to an end. In a recent interview with Bloomberg, EA’s CEO, Andrew Wilson, suggested that the publisher might move away from the annual release cycle and towards an updates and subscriptions model. It isn’t entirely surprising that EA would be considering this change for its sports titles. Games as a service is becoming an increasingly popular model across the games industry and EA has seen great success with service model games like Star Wars Battlefront. Wilson suggests that it’s the move towards downloads, online play and streaming that makes this possible. It’s clear that this is an idea still in its early stages given that Wilson didn’t offer any timeline or pricing ideas. However, given the current industry trends we wouldn’t be surprised to see it happen sooner rather than later. For those who purchase these annual releases without fail, it probably makes just as much sense to subscribe to a continually improving service as it does to buy a new game every year. Well, as long as the subscription fee doesn't come to much more than the cost they were already paying each year for the individual releases. It could potentially be more problematic for those who aren't inclined to purchase every game as it's released. 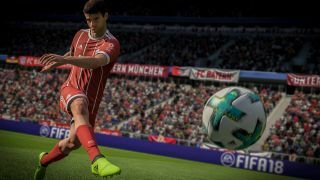 If the EA Sports titles become subscription based services, those who liked to dip in and out of the games as they pleased could find that's no longer an option. It's not certain whether that would be the case, though, and EA may open up an option that appeals to more casual fans. Developers would be more able to enter an open conversation with fans of the game, receive feedback and explain what changes can and can’t be made, while fans wouldn’t have to wait a year to buy a new game that feels more like a patch of the previous one. In the interview, Wilson seemed particularly interested in what the rise in augmented reality technology could mean for our mobile and console game experiences. It could, in some ways, unite them he suggests: "One day players could earn rewards based on how many eggs they have in their refrigerator at home when they are playing The Sims or get online points for real life drills at soccer practice before playing FIFA." This is, we imagine, somewhat further off than an annual subscription version of FIFA.